Cardiac muscle dysfunction resulting in heart failure can be reversed with appropriate diagnosis and therapy in nearly 25%8211;50% of all nonischemic cardiomyopathies. Diverse etiologies such as congenital, metabolic, toxic, infective, inflammatory, infiltrative, stress induced, and arrhythmia induced can cause myocardial dysfunction which can be restored to normal. All morphologic types including dilated, hypertrophic, and restrictive cardiomyopathies can have an underlying reversible cause. Imaging modalities such as echocardiography, cardiac computed tomography (CT), positron-emission tomography-CT, and cardiac magnetic resonance along with appropriate biochemical tests can help diagnose these varied etiologies. Recognizing reversible myocardial dysfunction at an early stage of the disease helps avoid inappropriate prolonged therapy for heart failure and repeated hospital admissions and may result in a cure in a significant number of cases. Cardiomyopathy (CM) comprises diverse and heterogeneous group of diseases affecting myocardium resulting in cardiac dysfunction. They are typically treated with standard heart failure pharmacological regimen in addition to mechanical circulatory support devices or orthotopic heart transplantation in severe refractory cases. Fortunately, there are several reversible cardiomyopathies that have been proven to show a return to normal cardiac function with appropriate management. In several large clinical trials, the prevalence of potentially reversible nonischemic CM ranged from 25% to 50%. The prognosis of these reversible cardiomyopathies is better than ischemic or other nonischemic cardiomyopathies. It is important to look for reversible myocardial dysfunction while evaluating patients with heart failure. Diverse etiologies such as congenital, metabolic, toxic, infective, inflammatory, infiltrative, and stress induced 8211; physical or mental [Table 1] 8211; can cause myocardial dysfunction which can be restored to normal, if the cause is identified in early stage of disease. Imaging modalities such as echocardiography, cardiac computed tomography, and cardiac magnetic resonance (CMR) help us diagnose these varied etiologies. Stress CM is a rapidly reversible form of acute heart failure reported to be triggered by stressful events and associated with a distinctive left ventricular (LV) contraction pattern. It is also known as apical ballooning or broken heart syndrome. In its typical form, it presents as contractile dysfunction of the mid and apical LV segments with hyperkinesis of basal walls, producing a balloon-like appearance of the distal ventricle in systole. Other atypical forms are reverse Takatsubo, right ventricular Takatsubo, and global hypokinesis. Apical Takastubo CM was identified in 81.7%, midventricular in 14.6% and basal and focal were diagnosed in 2.2% and 1.5%, respectively, in a large series reported by Templin et al. More than half of the patients with Takastubo CM (55.8%) had a history of acute neurologic or psychiatric disorder. Symptoms are typically preceded by exposure to emotional [Figure 1] or physical stressors. The presentation can be similar to acute myocardial infarction with chest pain, dyspnea rapidly progressing to pulmonary edema. The pathophysiolgical mechanisms postulated are increased catecholamines leading to coronary spasm in all territories, increased systemic vascular resistance, and cardiac afterload. They also lead to hypercontraction and possible LV outflow tract obstruction leading to increased stress in LV apex. Myocardial stunning due to microvascular dysfunction in patients with Takastubo CM may be of neurogenic origin. The association of this CM with epilepsy, electroconvulsive therapy, subarachnoid hemorrhage, head injury, stroke, and anxiety and depression  supports this neurogenic etiology of Takastubo CM. In addition, there have been reports linking this entity to certain medications and toxins such as albuterol, high-dose intravenous cytarabin, 5 fluorouracil, entacopone, and allopurinol. It was also observed in postoperative period after noncardiac surgeries. Sudden acute severe LV dysfunction was reported by Anjaneyulu et al. after difficult intubation in a patient who was scheduled for a minor nasal surgery. This patient required intra-aortic balloon support for 72 h, before making a complete recovery of LV function. Her coronary angiogram was normal. The same authors observed similar cases of acute LV dysfunction following extubation and also during first 248211;48 h of postoperative period following noncardiac surgery. Pheochromocytoma can present as Takatsubo CM and should be considered in patients with hypertension and acute stress-induced CM without evidence of acute coronary disease and normal coronary angiogram. Thyrotoxic crisis can present as Takastubo like acute cardiac dysfunction. In Takastubo CM, the LV function usually returns to normal within a few weeks. In acute phase, inotropic, ventilatory, intra-aortic balloon supports may be required. Up to 1.2% of patients can die in hospital as a result of cardiogenic shock. The prognosis is generally good, yet there remains an 11.4% rate of recurrence in 4 years. Some of the severe complications observed include ventricular tachycardia (3.0%), ventricular thrombus (1.3%), and ventricular rupture (0.2%). Arrhythmia-induced CM (AIC) is characterized by a primary CM in which persistent tachycardia causes elevated ventricular filling pressures, severe biventricular systolic dysfunction, reduced cardiac output, and elevated systemic vascular resistance. Correction of tachyarrhythmia can cause return of cardiac function. An arrhythmia that is insidious, persistent, and well tolerated is more likely to result in AIC. The key diagnostic feature of AIC is the presence of pathological tachycardia or persistent arrhythmia (frequent ventricular ectopic beats) in the presence of an otherwise unexplained CM. It can be difficult to determine whether an arrhythmia is the initiator or consequence of CM. Patients with AIC have a smaller LV end-diastolic diameter and mass index versus those with preexisting dilated CM and concomitant tachyarrhythmia. CMR may help differentiate AIC from dilated CM. Late gadolinium enhancement suggesting an underlying scar is suggestive of primary CM. Atrial fibrillation, atrial flutter, atrial tachycardia, reentrant supraventricular tachycardia, accessory pathway tachycardia, frequent ectopic beats, and ventricular tachycardia are shown to cause persistent myocardial dysfunction. Any sustained rate above 100 beats/min may be important prognostic factor. Ablation is a viable option for atrial arrhythmias as well as all other arrhythmias in which sinus rhythm can be restored. Frequent premature ventricular contractions (PVCs) can lead to CM as evidenced by a case in which PVCs as high as 56,000/day with reduced left ventricular ejection fraction (LVEF) had a successful ablation followed by normal LV function. Although ablation offers effective results, it may not be a permanent solution. Ling et al. observed in 18 patients who after initial improvement after ablation had decrease in LVEF after 5 years with diffuse myocardial fibrosis and reduced myocardial strain and twist rates on cardiac imaging studies. Inflammatory CM (IC) is defined as inflammatory disease of the myocardium (myocarditis) with cardiac dysfunction. Infectious and noninfectious causes can result in IC. Infections are primarily viruses such as Coxsackie, cytomegalovirus, parvovirus, mumps, H1N1, and hepatitis C virus. Bacteria, mycobacteria, fungi, protozoa, rickettsiae, chlamydiae, and parasites have all been implicated in IC. Once a diagnosis of IC is made, supportive care is usually the first line of treatment as many cases of IC have been shown to spontaneously resolve. A case series of reversible acute CM associated with H1N1 influenza infection has been reported by Barbandi et al. Sepsis-induced cardiac dysfunction can be seen in as high as 60% of patients and can contribute to increased mortality. It is mainly manifested as biventricular dilatation and depressed LVEF. Targeting the underlying infectious process with appropriate antibiotics and providing hemodynamic support can result in restoration of cardiac function. 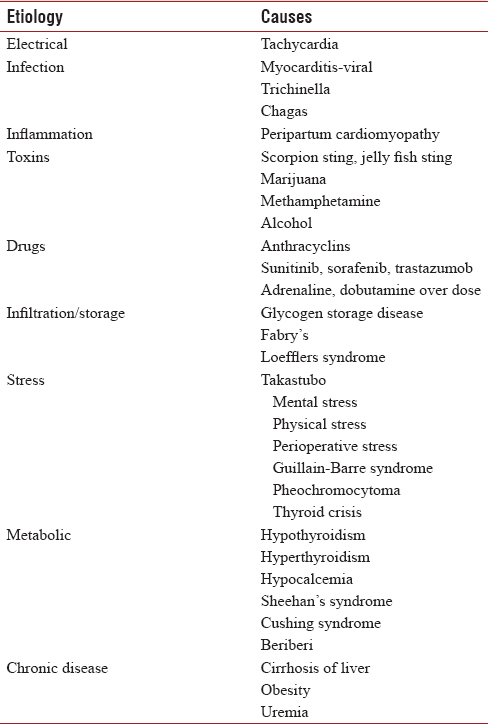 Noninfectious causes of IC include toxins, alcohol, cytotoxic chemotherapy, and metabolic abnormalities. Toxins that can produce reversible myocardial dysfunction include scorpion sting, jell fish sting, carbon monoxide, marijuana, methamphetamine, and alcohol. Accidental overdose of adrenaline  and dobutamine was reported to cause severe ventricular dysfunction with subsequent near complete recovery of ventricular function. Chemotherapy drugs such as anthracyclins, tyrosine kinase inhibitors8211;sunitinib, sorafenib, and trastazumob can cause cardiac dysfunction which is shown to reverse when diagnosed in the early stage. Myocardial tissue velocity imaging is helpful in identifying early dysfunction during therapy with these agents. Complete recovery of myocardial function was shown in 42%, partial recovery in 13% of patients on anthracyclin therapy in a series of 201 patients by Cardinale et al. Alcohol though commonly causes chronic CM can also cause acute heart failure which improves with therapy and abstinence. 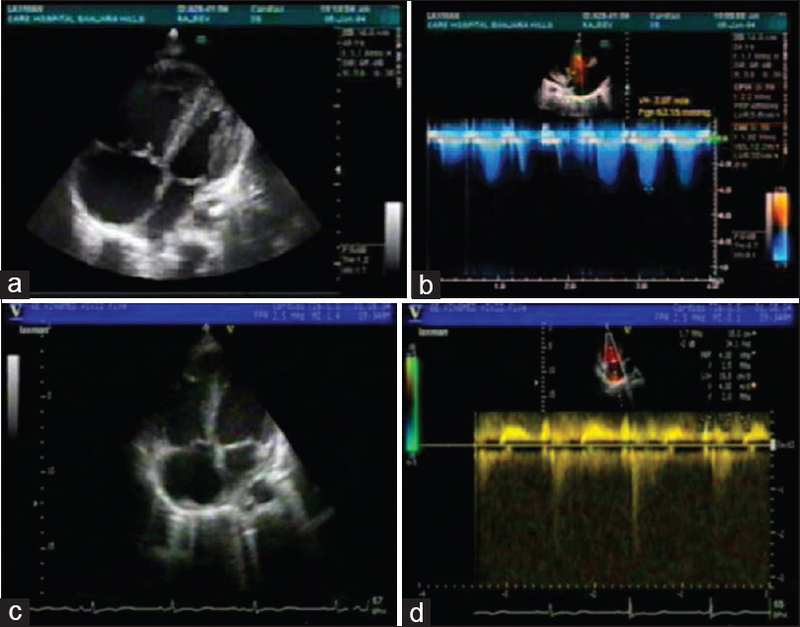 A case of acute reversible LV dysfunction secondary to excess alcohol ingestion was reported by Mahmoud et al. Peripartum CM (PPCM) is defined by four criteria: (1) development of HF symptoms either during the last month of pregnancy or within the first 5 months of delivery; (2) no other identifiable causes of heart failure exist; (3) no evidence of heart disease prior to the last month of pregnancy; and (4) LV systolic dysfunction. Approximately 30%8211;50% of patients have noted significant improvement in cardiac function in the first 6 months after presentation. Although its cause remains unknown, most theories have focused on the hemodynamic, inflammatory, oxidative, and immunologic stresses of pregnancy and genetic susceptibility. For the management of PPCM, a multidisciplinary approach involving a cardiologist, obstetrician, intensivist, anesthesiologist, and pediatrician is essential. Ace inhibitors should be avoided in the last 2 trimesters. Hydralazine and nitrates may be safely used as alternative therapies. β1 selective beta blockers are preferred because β2 receptor blockers may have an antitocolytic effect. Heparin may be required in patients with a low EF (<35%) to prevent LV thrombus. PPCM is associated with high risk of recurrence in subsequent pregnancies, both in patients who have recovery of LV function and in those with persistent LV dysfunction. Metabolic CM is a secondary CM that results from disturbed energy production leading to impaired cardiac function. It may be caused by endocrine disorders, familial storage diseases, and/or nutritional deficiencies. Hypothyroidism can result in low-output CM by downregulating the thyroid hormone receptors in the myocardium causing decreased myocardial excitation and contractility. Severe hypothyroidism resulting in dilated CM and heart failure was shown to reverse after return to euthyroidism with L-thyroxin therapy. Thyroid hormones have positive inotropic effects on myocardium through their action on Na/K ATPase, Na/Ca exchanger, and various K channels and vasodilatory effects on peripheral arteries. The increased preload and decreased peripheral vascular resistance leads to a high cardiac output even at rest resulting in CM. Beta blockers may be beneficial in these patients. In a small study by Biondi et al., hyperthyroid patients treated with the selective β1-adrenoceptor antagonist bisoprolol experienced normalization of the LV mass index and LV systolic function after 6 months of treatment. Hypoparathyroidism is associated with chronic hypocalcemia which can result in LV systolic dysfunction and may present as dilated CM. Parathyroid adenoma surgery and thyroid gland surgery can also result in hypoparathyroidism and resultant hypocalcemia. Intravenous calcium and calcitrol administration leads to correction of hypocalcemia and LV dysfunction [Figure 2]. Sheehan's syndrome is caused by acute pituitary necrosis following postpartum hemorrhage. Acute presentation of Sheehan could be in the form of hyponatremia (hypocortisolemia), hypoglycemia, and cardiac failure. It may be misdiagnosed as PPCM. Low free T4, low cortisol levels offer a clue. Replacement of thyroid and cortisol hormones results in recovery of LV function. Cushing syndrome is uncommon but potentially reversible cause of dilated CM, most often reported in patients with hypercortisolism from an adrenal adenoma. Cortisol may directly act on myocardium through glucocorticoid receptors. Johnston et al. reported a case of CM attributable to hypercortisolism and responsive to eucorticosolemic state following bilateral adrenalectomy. Chronic alcoholism, anorexia nervosa, prolonged parenteral nutrition, and thiaminase-containing fish diet can result in thiamine deficiency. The cardiovascular signs and symptoms include dyspnea, fatigue, leg edema, and palpitations. Tachycardia, raised jugular venous pressure, and warm extremities are common. Biventricular heart failure is present and circulation is usually hyperkinetic. When prolonged, circulatory collapse, metabolic acidosis, and/or shock can develop at which time the disease has advanced from chronic beriberi to fulminating beriberi heart failure (Shoshin beriberi). Severe lactic acidemia in the presence of high cardiac output is a classic feature of acute fulminant cardiovascular beriberi. If unrecognized and untreated, it can lead to high output cardiac failure and death. One of the rare presentations of cardiac beriberi can be severe pulmonary hypertension and right heart failure which return to normal following thiamine administration [Figure 3]. Decreased serum thiamine and reduced erythrocyte trans-ketolase levels establish the diagnosis. A dramatic therapeutic response to intravenous thiamine will substantiate the diagnosis. Chronic disease in other organ systems 8211; liver, kidney, and adipose tissue 8211; can have deleterious effects on the heart leading to a secondary CM. Cirrhotic CM is defined as an increase in basal cardiac output with systolic and/or diastolic dysfunction, but without evidence of heart failure at rest and a prolonged QT interval. Major stresses on the cardiovascular system such as liver transplantation, infections, and insertion of transjugular intrahepatic portosystemic stent-shunts can unmask the presence of cirrhotic CM and convert latent to overt heart failure. Current management recommendations are empirical, nonspecific, and mainly supportive measures. The exact prognosis is not clear. Reversibility is possible (either pharmacological or after liver transplantation). Torregrosa et al. were able to show reversal of cardiac alterations after orthotopic liver transplantation. In obesity CM also, hyperdynamic circulation is present and is brought about by a metabolic surge due to increased adipose tissue metabolism. Increased blood volume and cardiac output lead to structural changes, including LV hypertrophy and dilatation. The state of chronic inflammation induced by obesity, hyperglycemia-induced cardiac apoptosis, and the effect of adipokines namely adiponectin and leptin on cardiomyocytes contribute to the pathogenesis of obesity CM. Weight loss through bariatric surgery has given favorable results. McCloskey et al. showed 50% reduction in weight 6-month postprocedure with an improvement in the LVEF from 23% ± 2% to 32% ± 4%. Bariatric surgery is also effective in reducing LV mass, LV cavity size, oxygen consumption rate, and LV diastolic function. Uremic CM occurs due to a state of pressure and volume overload. This initially results in LV hypertrophy, but chronic overload causes dilatation and leads to systolic dysfunction. Myocardial fibrosis may also occur, which contributes to diastolic dysfunction. Kidney transplantation is the most effective solution for uremic CM, as seen by an improvement in the LVEF from 31.6% ± 6.7% pretransplant to 52.2% ± 12%, 12-month posttransplant. Fabry's disease is an X-linked recessive disorder that results in deficiency of the lysosomal enzyme β-galactosidase A and the resultant accumulation of glycosphyngolipids in lysosomes. There is diffuse involvement of the myocardium, vascular endothelium, conduction system, and valves 8211; most notably mitral valve. Echocardiographic binary appearance of LV endocardial border, reflecting endomyocardial glycosphingolipids compartmentalization, represents a sensitive and specific diagnostic hallmark of Fabry's CM. The endomyocardial biopsy and low plasma β-galactosidase activity offer a definitive diagnosis. Enzyme replacement therapy for Fabry's disease is safe and effective, leading to symptomatic, clinical, and echocardiographic improvement. Hypereosinophilia associated with Loefflers endocarditis is usually characterized by eosinophil counts exceeding 1500/mm 3 for at least 6 months. Toxic substances in the granules of eosinophils that infiltrate the myocardium cause the necrotic phase, which leads to the thrombotic and fibrotic phases subsequently. In the initial thrombotic phase, this disease can present acutely with fever, eosinophilia, and rapid-onset heart failure. Echocardiography at this stage may show apical obliteration in both ventricles. Treatment with steroids, warfarin for a period of 6 months has shown to resolve heart failure with disappearance of apical masses in the ventricles. Mohamad et al. described two similar severe cases of Loefflers endocarditis in which eosinophilic infiltrations obliterated the entire right ventricular cavity and caused severe right ventricular dysfunction and heart failure. 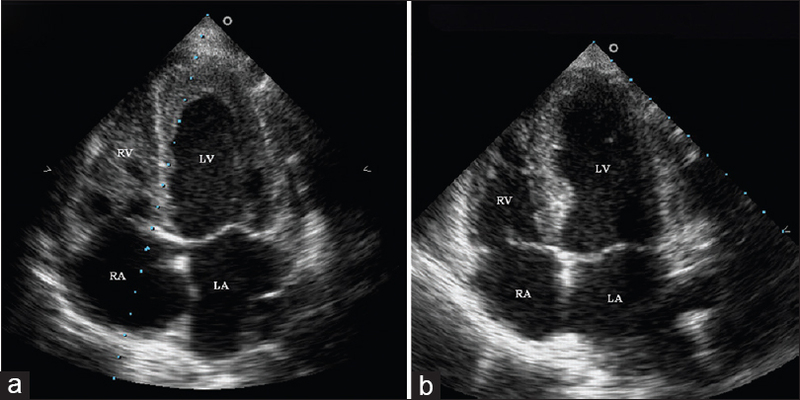 Three to six months after prednisolone therapy, both the patients became asymptomatic and only mild right and LV endocardial thickening was seen on echocardiography  [Figure 4]. Severe ventricular dysfunction in neonates and infants is commonly due to myocarditis. However, causes such as tachycardia-induced CM, hypocalcemia, and hypothyroidism should be looked for since they are potentially reversible. Some of the congenital heart diseases presenting as severe ventricular dysfunction in neonates may mimic myocarditis. These include anomalous left coronary artery from pulmonary artery, severe aortic stenosis, and severe coarctation. In older children with malnutrition, Beriberi should be considered. Templin C, Ghadri JR, Diekmann J, Napp LC, Bataiosu DR, Jaguszewski M, et al. Clinical features and outcomes of takotsubo (Stress) cardiomyopathy. N Engl J Med 2015;373:929-38. Le Ven F, Pennec PY, Timsit S, Blanc JJ. Takotsubo syndrome associated with seizures: An underestimated cause of sudden death in epilepsy? Int J Cardiol 2011;146:475-9. Sharp RP, Welch EB. Takotsubo cardiomyopathy as a complication of electroconvulsive therapy. Ann Pharmacother 2011;45:1559-65. Lee VH, Connolly HM, Fulgham JR, Manno EM, Brown RD Jr., Wijdicks EF, et al. Tako-tsubo cardiomyopathy in aneurysmal subarachnoid hemorrhage: An underappreciated ventricular dysfunction. J Neurosurg 2006;105:264-70. Riera M, Llompart-Pou JA, Carrillo A, Blanco C. Head injury and inverted takotsubo cardiomyopathy. J Trauma 2010;68:E13-5. Yoshimura S, Toyoda K, Ohara T, Nagasawa H, Ohtani N, Kuwashiro T, et al. Takotsubo cardiomyopathy in acute ischemic stroke. Ann Neurol 2008;64:547-54. Summers MR, Lennon RJ, Prasad A. Pre-morbid psychiatric and cardiovascular diseases in apical ballooning syndrome (tako-tsubo/stress-induced cardiomyopathy): Potential pre-disposing factors? J Am Coll Cardiol 2010;55:700-1. Baumann S, Huseynov A, Goranova D, Faust M, Behnes M, Nolte F, et al. Takotsubo cardiomyopathy after systemic consolidation therapy with high-dose intravenous cytarabine in a patient with acute myeloid leukemia. Oncol Res Treat 2014;37:487-90. Knott K, Starling N, Rasheed S, Foran J, Cafferkey C, Rosen S, et al. A case of Takotsubo syndrome following 5-fluorouracil chemotherapy. Int J Cardiol 2014;177:e65-7. Baldacci F, Vergallo A, Del Dotto P, Ulivi M, Palombo C, Casolo G, et al. Occurrence of Takotsubo syndrome in a patient with Parkinson's disease after entacapone add-on. Parkinsonism Relat Disord 2014;20:1313-4. Madias JE. Late presentation of allopurinol-induced Takotsubo syndrome. Int J Cardiol 2015;178:212. Anjaneyulu A, Reddy VK, Raju PK, Rajagopalaraju A, Kumar AS, Ravichandra R, et al. Acute reversible left ventricular dysfunction following general anesthesia. Indian Heart J 2001;53:508-10. Hasdemir C, Yuksel A, Camli D, Kartal Y, Simsek E, Musayev O, et al. Late gadolinium enhancement CMR in patients with tachycardia-induced cardiomyopathy caused by idiopathic ventricular arrhythmias. Pacing Clin Electrophysiol 2012;35:465-70. Chugh SS, Shen WK, Luria DM, Smith HC. First evidence of premature ventricular complex-induced cardiomyopathy: A potentially reversible cause of heart failure. J Cardiovasc Electrophysiol 2000;11:328-9. Ling LH, Kalman JM, Ellims AH, Iles LM, Medi C, Sherratt C, et al. Diffuse ventricular fibrosis is a late outcome of tachycardia-mediated cardiomyopathy after successful ablation. Circ Arrhythm Electrophysiol 2013;6:697-704. Calabrese F, Thiene G. Myocarditis and inflammatory cardiomyopathy: Microbiological and molecular biological aspects. Cardiovasc Res 2003;60:11-25. Barbandi M, Cordero-Reyes A, Orrego CM, Torre-Amione G, Seethamraju H, Estep J, et al. A case series of reversible acute cardiomyopathy associated with H1N1 influenza infection. Methodist Debakey Cardiovasc J 2012;8:42-5. Fyfe AI, Daly PA, Dorian P, Tough J. Reversible “cardiomyopathy” after accidental adrenaline overdose. Am J Cardiol 1991;67:318-9. Uraizee I, Cheng S, Moslehi J. Reversible cardiomyopathy associated with sunitinib and sorafenib. N Engl J Med 2011;365:1649-50. Cardinale D, Colombo A, Lamantia G, Colombo N, Civelli M, De Giacomi G, et al. Anthracycline-induced cardiomyopathy: Clinical relevance and response to pharmacologic therapy. J Am Coll Cardiol 2010;55:213-20. Mahmoud S, Beauchesne LM, Davis DR, Glover C. Acute reversible left ventricular dysfunction secondary to alcohol. Can J Cardiol 2007;23:475-7. Demakis JG, Rahimtoola SH, Sutton GC, Meadows WR, Szanto PB, Tobin JR, et al. Natural course of peripartum cardiomyopathy. Circulation 1971;44:1053-61. Biondi R, Tazio S, Carellac. Control of adrenergic overactivity by betablockade Improves quality of life in patients receiving long-term suppressive therapy with Levothyroxine. The Journal of Clinical Endocrinology & Metabolism 1994;78:1028-33. Natarajan V, Asha HS, Paul T, Sunithi MD. Sheehans syndrome with reversible cardiomyopathy. OA Case Rep 2014;3:44. Johnston PC, Atkinson AB, Moore MJ, Sharma D, Black NR, Dixon LJ, et al. An unusual cause of reversible cardiomyopathy. Ulster Med J 2012;81:134-5. Baik SK, Fouad TR, Lee SS. Cirrhotic cardiomyopathy. Orphanet J Rare Dis 2007;2:15. McCloskey CA, Ramani GV, Mathier MA, Schauer PR, Eid GM, Mattar SG, et al. Bariatric surgery improves cardiac function in morbidly obese patients with severe cardiomyopathy. Surg Obes Relat Dis 2007;3:503-7. Wali RK, Wang GS, Gottlieb SS, Bellumkonda L, Hansalia R, Ramos E, et al. Effect of kidney transplantation on left ventricular systolic dysfunction and congestive heart failure in patients with end-stage renal disease. J Am Coll Cardiol 2005;45:1051-60. Pieroni M, Chimenti C, De Cobelli F, Morgante E, Del Maschio A, Gaudio C, et al. Fabry's disease cardiomyopathy: Echocardiographic detection of endomyocardial glycosphingolipid compartmentalization. J Am Coll Cardiol 2006;47:1663-71. Pisani A, Visciano B, Roux GD, Sabbatini M, Porto C, Parenti G, et al. Enzyme replacement therapy in patients with Fabry disease: State of the art and review of the literature. Mol Genet Metab 2012;107:267-75. Ostovan MA, Aslani A. Löffler's endocarditis: The hypereosinophilic syndrome. Eur J Echocardiogr 2008;9:401-2.